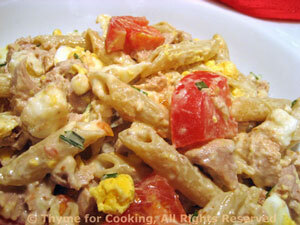 Tuna Pasta Salad, from Thyme for Cooking's seasonal menus. What's summer without, at least one, 'Tuna Macaroni' salad. This is a 2-salad dinner. Using a yogurt based rather than mayonnaise based dressing keeps it healthy... but still creamy. When done, drain and rinse lightly with cool water. Make dressing: Whisk all ingredients together. It will be quite thick. Peel eggs and roughly chop. Add half of the dressing to the pasta and toss gently to coat. Break up tuna and add to pasta along with the rest of the ingredients, Toss lightly to combine. 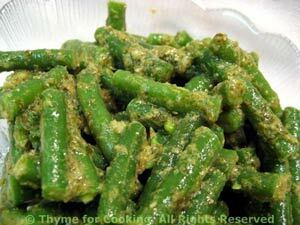 Taste and add as much more dressing as desired.